This entry was posted in Line drawings and tagged Bonnieux, Chairs on December 27, 2015 by joelmeyerowitz2014. 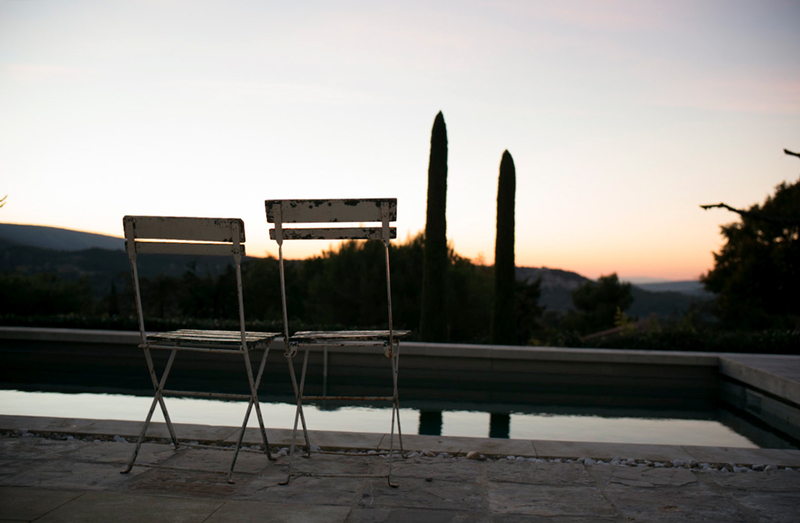 This entry was posted in Chair and tagged Bonnieux, Chairs, Dusk, France, Provence on November 12, 2015 by joelmeyerowitz2014. Chairs are sitting everywhere. And as I wrote earlier this month, I have been collecting them in a steady but casual way for many years, slowly watching them build a presence in my archive. I have no doubt that one day I’ll find the time to take a hard look at the collection to see if it is worth publishing as a book. 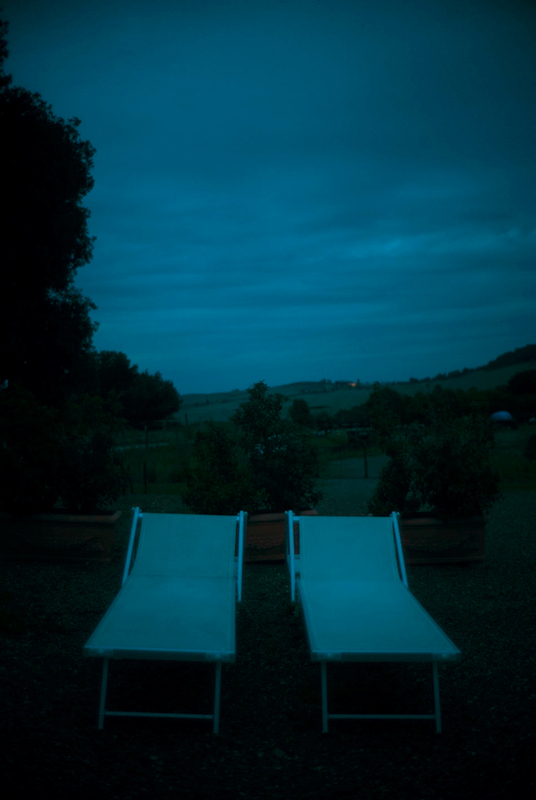 What I like about this particular body of work is that I’m not out hunting for them to become a set of photographs. The work grows on its own like a kind of ‘folk art’ collection of oddities that accumulates its strength from the variety of the objects in it. 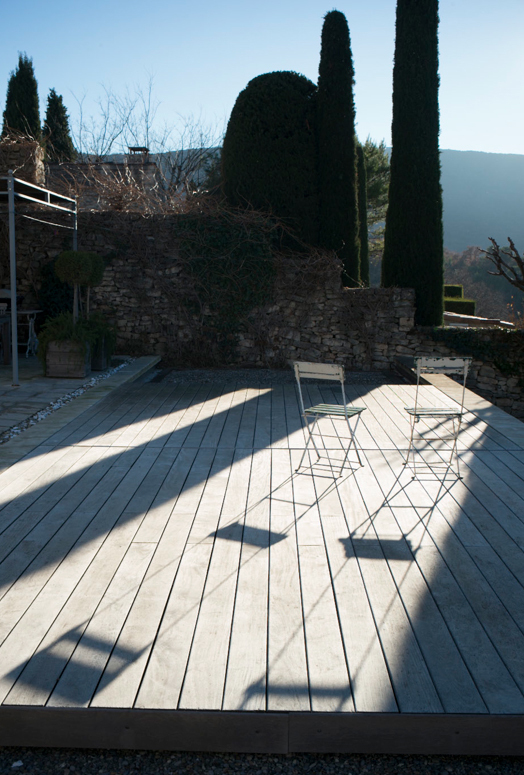 What pleases me in this photograph, besides the contrast between the two value systems within the frame (the place and the chairs) is the amazing object the chairs make when seen stacked that way. The chair’s simple form becomes a rich and beautifully graphic result as a single design motif, in a way it is just like all the wooden beading everywhere in the paneling. It accumulates by simple addition until we take in the wonder of it. That coat rack ain’t so bad either. 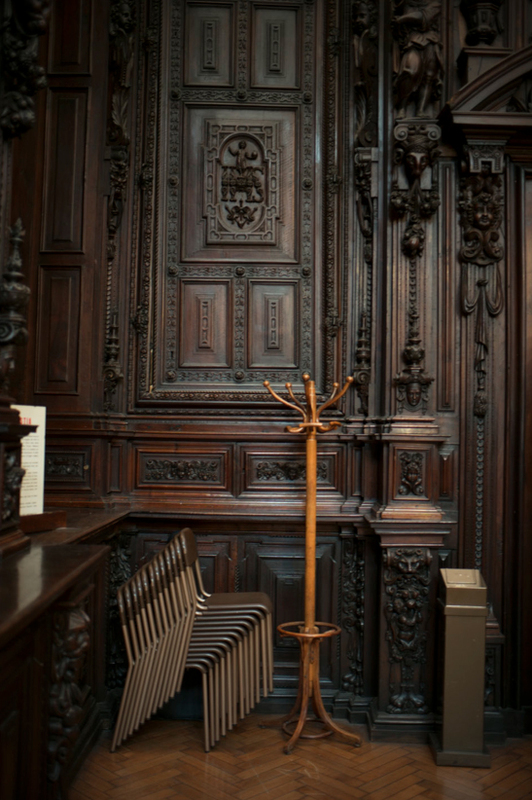 This entry was posted in Chair, Church, Interior, Italy and tagged Chairs, Interior on October 30, 2015 by joelmeyerowitz2014. For many years I have come across chairs, both humble or grand, sitting out in the world waiting to be sat in or carted away. These relics have shown their personalities to me in a variety of countries and cities, and in some strange way I have become a collector of them, but to what end I never knew. Oh, yes, I’ve thought, and maybe even said to friends, “some day I’d like to put a book together with these chairs,” but it hasn’t happened yet. 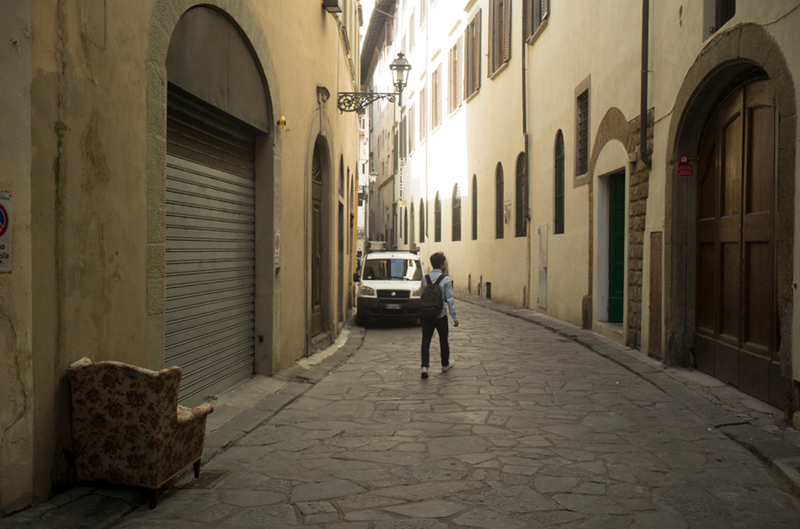 While in Florence for the opening of the Leica store I mentioned in the last post, I wound my way through the back streets to get to know the place a little better. Of course the chairs found me, or I them. On that day these 2 showed up, and while I was on the streets some hand made wall messages also called out for attention. 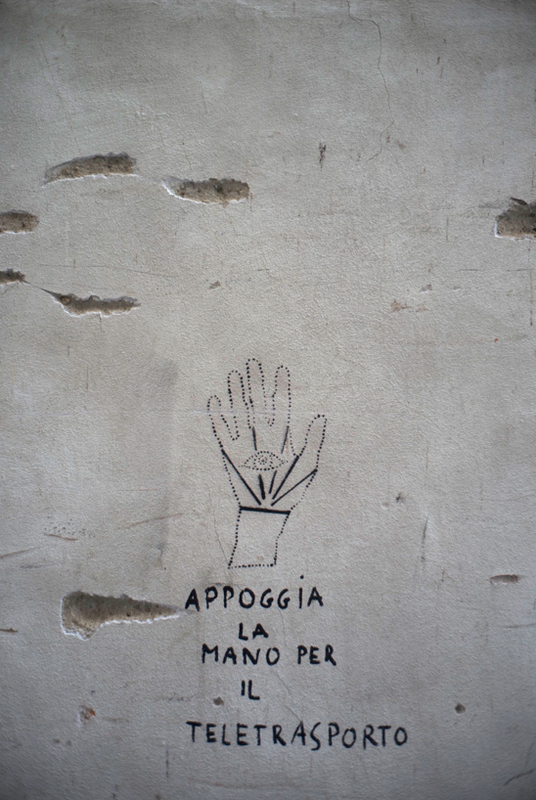 I particularly liked the one that says, “place your hand to be tele-transported,” And I was! 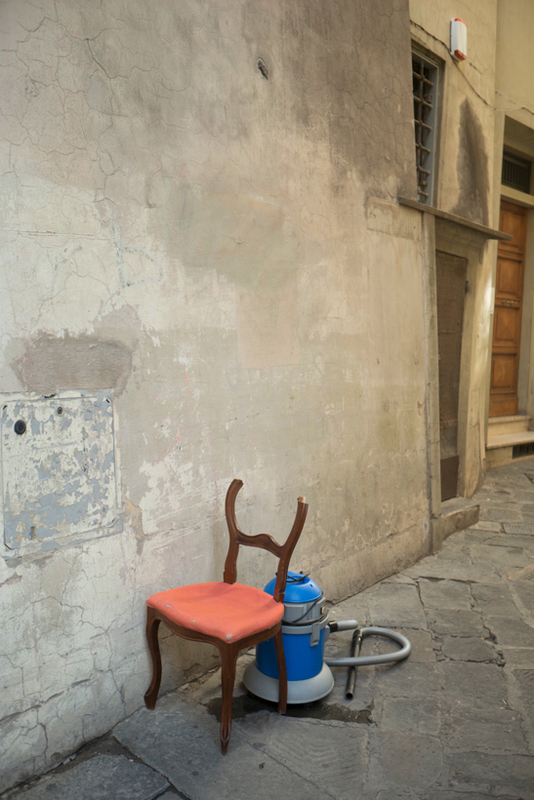 This entry was posted in Chair, City life, Florence, Line drawings, Street photography and tagged Chairs, Signs, Wall on October 12, 2015 by joelmeyerowitz2014. For many years now I have seen dispossessed chairs hanging out wherever chance has tossed them, like old souls left on their own after a long and faithful service. Like us they have backs and arms and legs and feet and definitely bottoms, some even have a head of sorts. All of which, in some way, may make them so compelling. I have also photographed chairs within more noble or comfortable circumstances; thrones, Cardinal’s chairs, cushy corporate ones, and in nearly every imaginable location. In fact, during my time working inside Ground Zero, one of the most surprising first sights was the unbelievable numbers of chairs that had been thrown from the buildings and remained intact upon landing! These chairs became the bleachers from which the exhausted rescue and recovery workers watched the amazing daily drama while taking their breaks. Every chair you might conceive of, from the most elegant to the most humble, found its way back to being useful once again. How did I begin to notice ‘chairs’ as a subject? If I remember correctly it was while working on the light box (remember the light box?) when one day, while I was editing for something else, I noticed some funny chair pictures and tossed them to the top of the box, and then as others appeared I found myself becoming aware that this was a theme that I had not really known I was interested in. But the proof of interest was in the pictures that were appearing. And so I began looking out for them while editing and being more aware of them while out on the street. 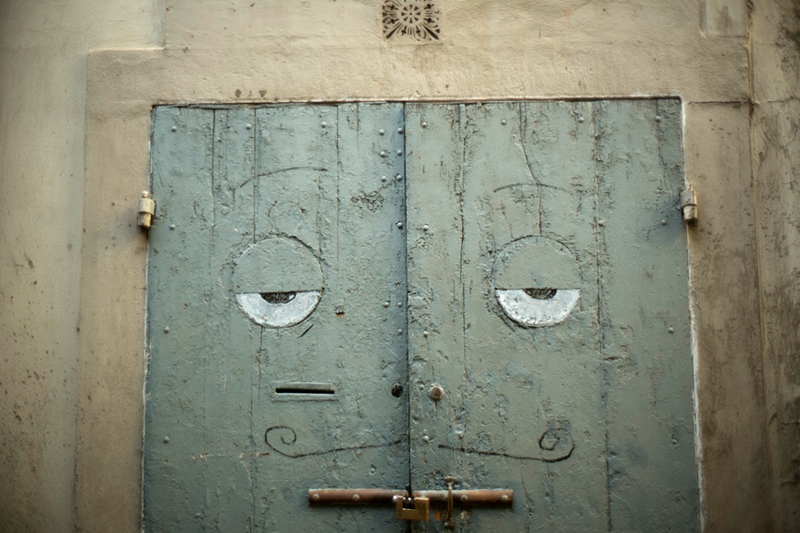 I believe that it’s important to be open to the suggestive impulses that emerge, either from the world, or out of the work, for these clues have in them the clearest indication of our natural, instinctive responses, our identity even, and also some sense of the consciousness we may be overlooking when we act in more premeditated ways. 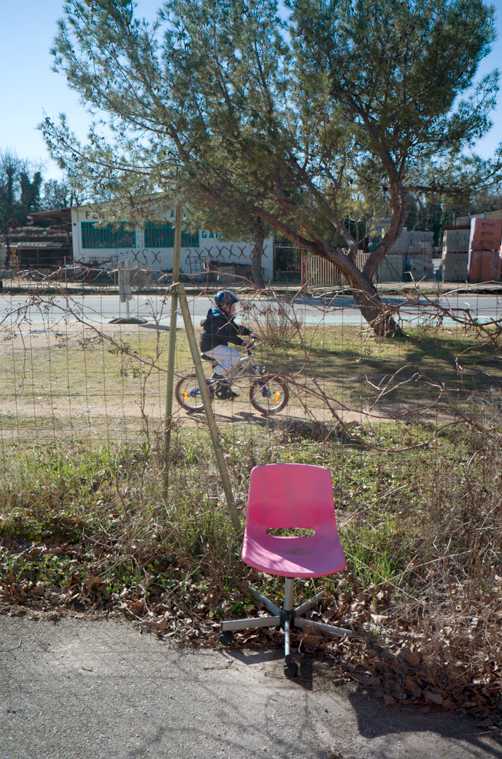 This entry was posted in Chair and tagged Chairs, France, Provence, street, Trees on February 16, 2015 by joelmeyerowitz2014. If there is one thing that 50 years of making photographs has taught me it is that every moment, no matter what it brings; joy, pleasure, sadness, pain, or the endless bounty of everything else we can feel, it passes as quickly as it came, and the continual renewal of every moment is all we can hope to be conscious of. It is the attachment to things, as if they were permanent, that gets us into trouble. So, first of all, I am grateful beyond words for all the loving, supportive and generous comments that flowed to me and Maggie today after yesterday’s challenging times. Yes! It was shocking to be setup like that by a band of thieves (we later learned that it’s a honey trap, and that many other travelers have lost their belongings at this roadside attraction). And the Police do nothing about it, figuring, we guess, ‘tourists get what’s coming to them, traveling with all their precious possessions, and the cops know insurance companies will cover the loss, so why bother looking, and, it aids the local economy’. What a way to live! But, back to your kindnesses. So many of you offered your thoughts about attachment, and our moment of loss, that it made us feel that there is hope when so many strangers offer this comfort so warmly. 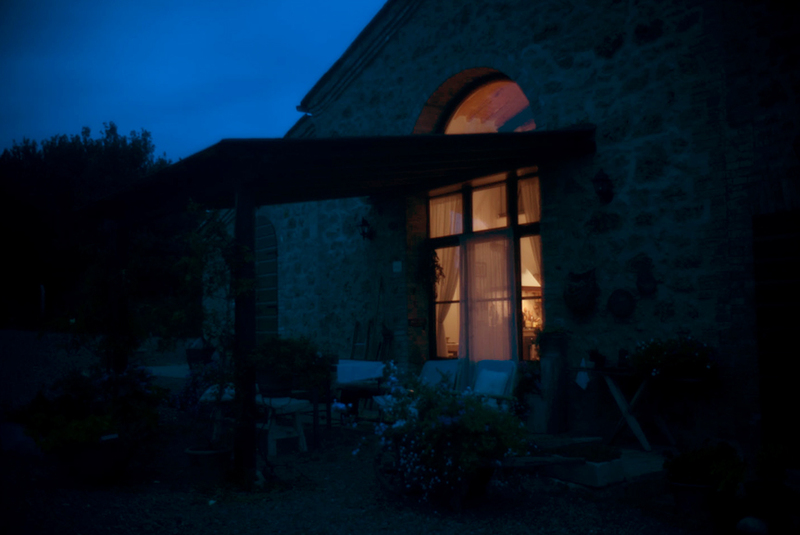 Maggie and I are already filling the space with new moments, new feelings, working through the lost items and memories, letting things go as we must, and painful as it is at moments, it is also becoming lighter to bear. Maggie even said to me today, and she lost more intimate, meaningful treasures than my replaceable things, “I say a prayer for those who had to live lives that brought them to a place where they treat other humans like this”. A day of retreat from all the aches of yesterday. As I walked past this stone cap at the end of a flight of stairs it took hold of me and made me pay attention. It made me step out of my inwardness and take in the vast, almost cosmic map quality of this humble stone in which mould, and fissures, and weathering, have made the surface dance the universal dance. As if stars exploded and atoms were splitting, and planetary movements were being etched by time on a glass plate negative. 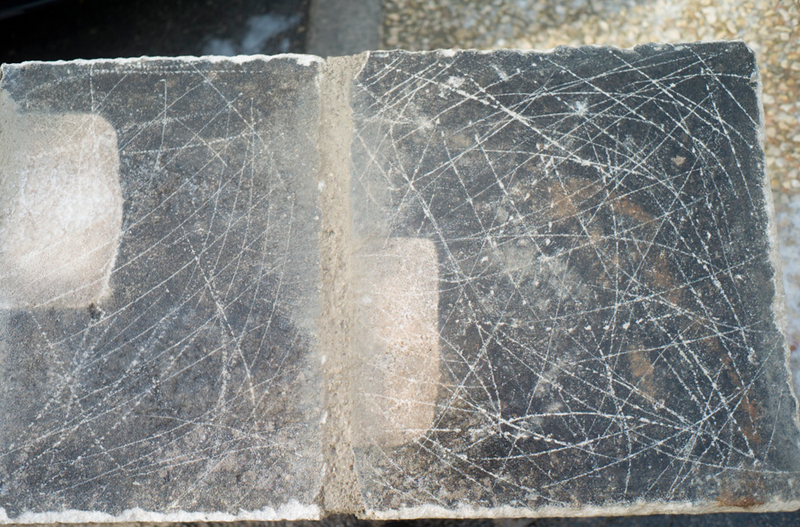 And perhaps that is what time has done to this stone. Simply left its marks while the stone aged. 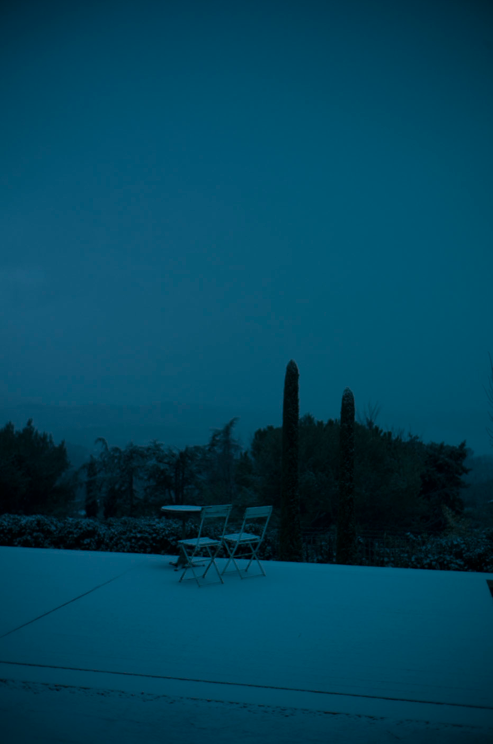 This entry was posted in Gratitude and tagged Bonnieux, Chairs, Dusk, Provence, Snow, stones on February 11, 2015 by joelmeyerowitz2014.